I have learned that stretching is a must when it comes to running after and injury. 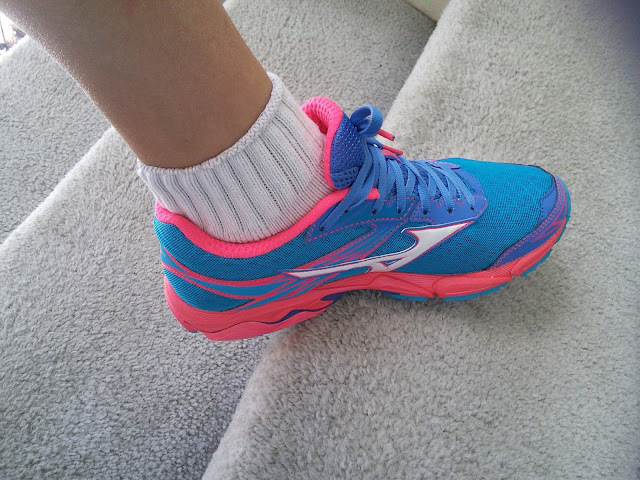 The one thing that is helping me get back to running is a lot of stretching. I have been not only doing leg stretches before and after my running, but I have found that stretching helps during my running. I have been increasing the amount of running time of my run/walk sessions and will stop to stretch about half way through my session. This stretching has helped me to run longer. I have been able to run for ten minutes before my muscles start to get tight. Then I walk for a minute and run for another ten minutes. I am feeling good about my running. Last week was a busy week. The boys were home for two days from school because of school conferences. They also get home early on Wednesday. So that meant three days that I had to run at the park. I really don't do well with running at the park as I have to run in circles so I get bored fast and I want to give up too soon. I am hoping by summer time that my 9 year old son can ride his bike for longer distances so I can run on the bike trails. The last time I tried the bike trails with my boys, he complained that his legs hurt half way into my running. Maybe getting out first thing in the morning might help, I sure hope so. This was the final week before my son's ROTC military ball and I wanted to look smashing in my dress. So I made sure that I ran every day and ate lots of healthy food. I don't know if I lost any weight as I hate stepping on the scale, but I did have to tighten my belt one more notch. I am afraid that stepping on the scale will either leave me depressed by the number or if I lost weight then I will use that as an excuse to eat more. So for now, I am going to continue to eat good and keeping running until I like what I see in the mirror. I really want to tone my belly by July for my other son's wedding. Here is how I looked for the military ball. I think I look good in this dress. Here are some other pictures from the ball. It was a fun time and I enjoyed talking with the other moms who sat at our table. I did enjoy a piece of cake too. That cake will motivate me to run today. 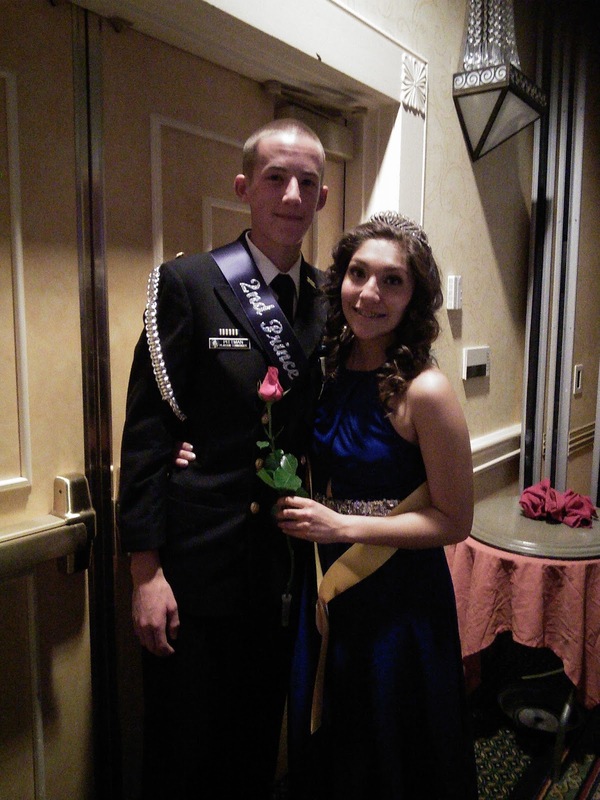 My son and his girlfriend were selected the prince and princess for the night. 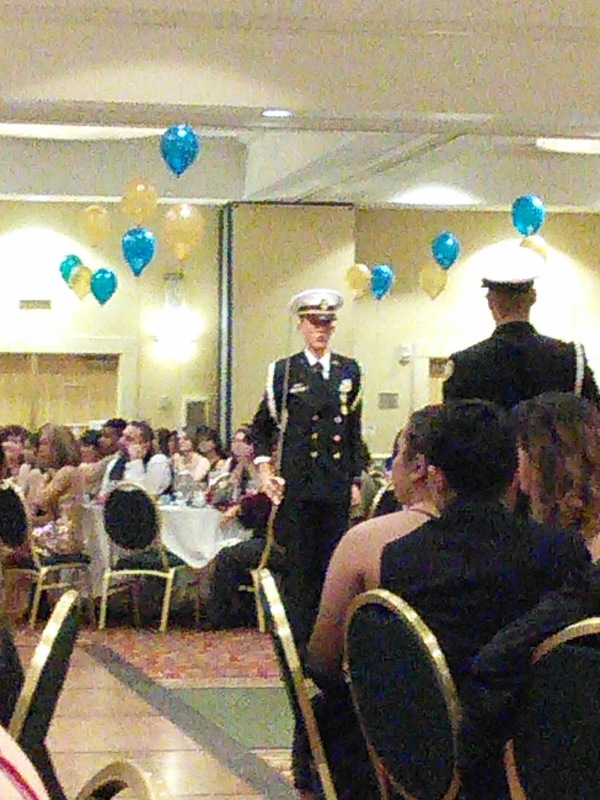 My son looked handsome in his uniform for the sword detail, I really need a better camera. My tablet does well in natural light not in a brightly lite room. My husband and I really enjoyed the ball. We are so proud of our son. He has a great future ahead of him. 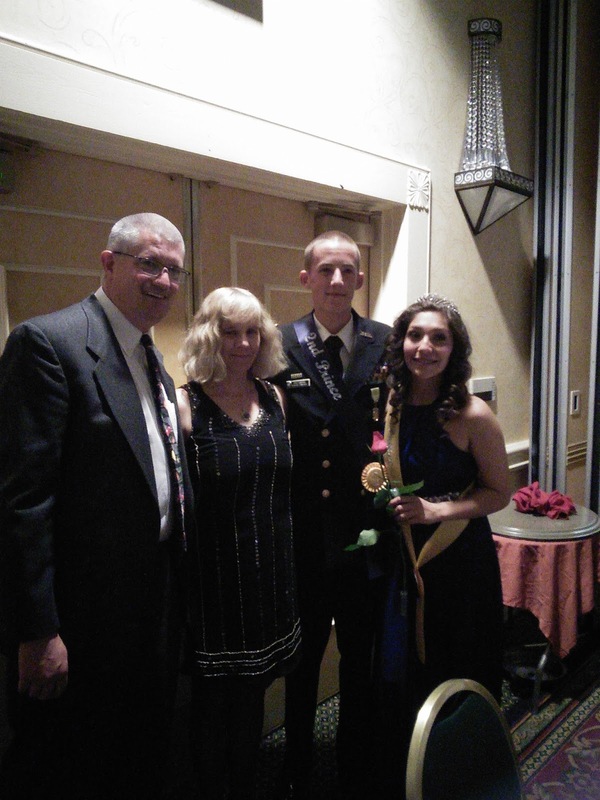 He plans to go to the naval academy and is doing well in school so he is well on his way. 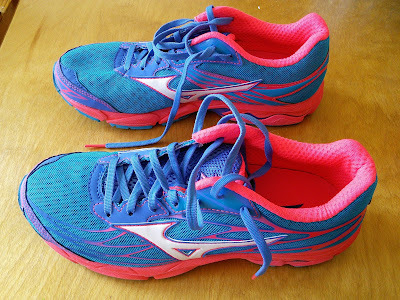 So time for me to lace up my shoes and get out running. Here is to a great week of running! Stretching is so important when I running; I learned that, too when I forgot to do it. You all look great at the ball, looks like a fun night!